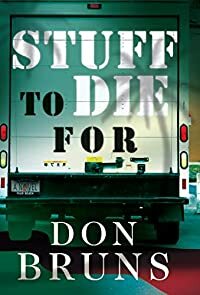 Stuff To Die For by Don Bruns, a Mysterious Review. Review: Don Bruns, author of the Mick Sever rock-and-roll mysteries, introduces a new series featuring James Lessor and Skip Moore, two underemployed best friends and roommates living in south Florida, in Stuff To Die For, a comedy-buddy-mystery that for the most part works on all three levels. It sounded like a good idea at the time. Skip (who narrates the story) and James decide to get into the hauling business. Everybody's got stuff they need to move and they (mostly James) think what with a little luck and hard work they can parlay their newly acquired box truck into a fleet in a few years. Never mind that neither one knows how to back up a truck without damaging something. Their first job comes via a reference: their friend Emily knows a woman who's going through a divorce and wants her husband's stuff hauled away. Seems easy enough, until while putting the stuff into storage, they discover a human finger with a class ring attached bearing the name of same school and graduating year as Skip and James. Maybe this plan of hauling other people's stuff wasn't such a good idea after all. The plot gets a little complicated at this point. The finger belongs to the class jock, Vic Maitlin, who, unbeknownst to but a few, saved Skip's life in high school. Consequently, Skip feels obligated to find out what transpired to cause Vic's finger to be in his possession. He and James end up getting hired to locate Vic by his father, an investor who is mixed up with a group of Cuban exiles plotting an invasion of their homeland. This all could have ended up being rather silly, or worse seriously dull, but Bruns handles it reasonably well, keeping the plot moving briskly forward, avoiding (with one notable exception) tangential plot points that would detract from the story, and instilling the characters with endearing qualities. The one exception is the incongruent subplot involving Emily's pregnancy that serves no relevant purpose being in this book. Stuff To Die For doesn't pretend to be more than it is, escapist fun in the form of a generally entertaining mystery. If for that reason alone, it deserves considerable credit. Acknowledgment: Maryglenn McCombs Book Publicity provided a copy of Stuff To Die For for this review.